Colossos XT Propane is 7 Machines in 1. Removes thinset, epoxy, glue, paint, mastic, and micro toppings; works on spalled or rained out concrete. Runs wet or dry on concrete, stone, hardwood, terrazzo or VCT tile. Can be converted to a wooden floor sander in seconds. The WerkMaster Colossos XT Propane is the ideal machine for projects where power is not available. 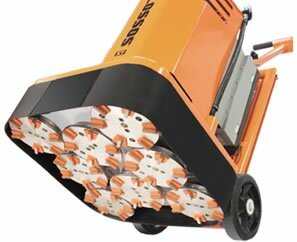 Grinder, stripper, scarifier, buffer, burnisher, polisher and edger – the Colossos XT Propane is 7 Machines in 1. Removes thinset, epoxy, glue, paint, mastic, and micro toppings; works on spalled or rained out concrete. Runs wet or dry on concrete, stone, hardwood, terrazzo or VCT tile. Exceeds OSHA standards for indoor operation ensuring the safety of the operator and the workplace environment. Featuring WerkMaster Octi-DiscTM technology with 8 counter rotating heads and the versatility of using our 8” (203 mm) ULTRA-Flex Plug ‘N Go tooling system, the Colossos XT Propane edges to within 1/8” (3 mm) of the wall. 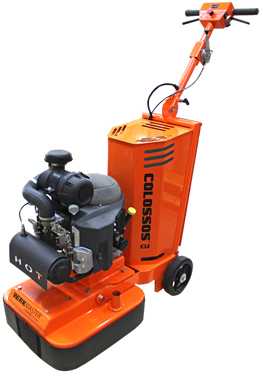 Easy to use and operator friendly the Colossos XT Propane weighs only 765 lbs (347 kg), has a 24” (61 cm) footprint uses a powerful 31 HP Kawasaki motor with variable speed controls on the handle. Comes with EZ Bak tilt and an adjustable, foldable handle for easy transport. The dual action vacuum port allows for dry, dust-free pick up and can be used with an optional water feature.